W49B is a highly distorted supernova remnant, produced by a rare type of explosion. Instead of radiating out symmetrically, W49B's exploding star shot more material out from its poles versus from its equator. There is evidence that W49B left behind a black hole — not a neutron star like most other supernovas. If confirmed, W49B would be the most recent black hole formed in our Galaxy. The highly distorted supernova remnant shown in this image may contain the most recent black hole formed in the Milky Way galaxy. The image combines X-rays from NASA's Chandra X-ray Observatory in blue and green, radio data from the NSF's Very Large Array in pink, and infrared data from Caltech's Palomar Observatory in yellow. The remnant, called W49B, is about a thousand years old, as seen from Earth, and is at a distance of about 26,000 light years away. The supernova explosions that destroy massive stars are generally symmetrical, with the stellar material blasting away more or less evenly in all directions. However, in the W49B supernova, material near the poles of the doomed rotating star was ejected at a much higher speed than material emanating from its equator. 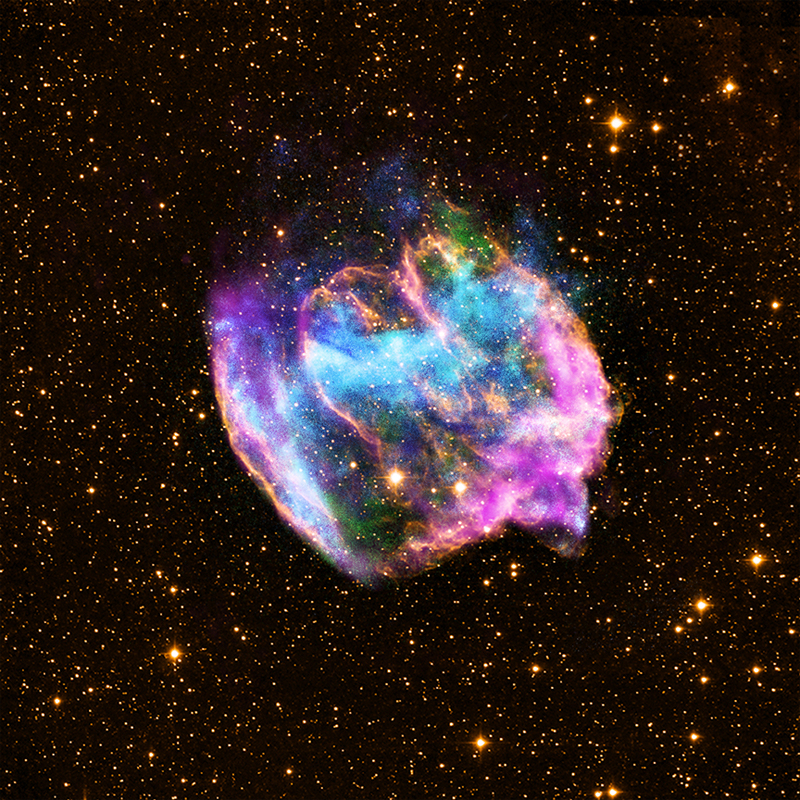 Jets shooting away from the star's poles mainly shaped the supernova explosion and its aftermath. 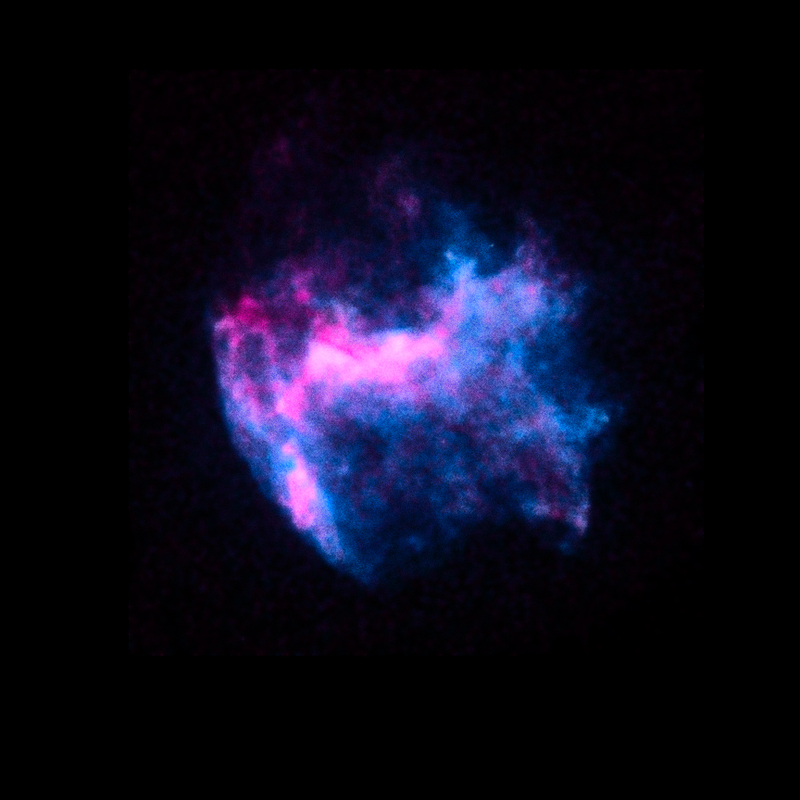 Chandra X-ray Image of W49B showing just the iron (purple) and silicon (blue). The new results on W49B, which were based on about two-and-a-half days of Chandra observing time, appear in a paper in the February 10, 2013 issue of the Astrophysical Journal. The authors of the paper are Laura Lopez, from the Massachusetts Institute of Technology (MIT), Enrico Ramirez-Ruiz from the University of California at Santa Cruz, Daniel Castro, also of MIT, and Sarah Pearson from the University of Copenhagen in Denmark. Coordinates (J2000) RA 19h 11m 07s | Dec +09° 06' 00"
Harvard showing us the stars. Very very cool. Much information about the stars. Material near the poles of the doomed rotating star was ejected at a much higher speed than material emanating from its equator. Jets shooting away from the star's poles mainly shaped the supernova explosion and its aftermath. W49B also is much more elongated and elliptical than most other remnants, Most of the time, massive stars that collapse into supernovas leave a dense, spinning core called a neutron star. How did astronomers arrive at a date of the visual flare around 1,000 years ago? The Chinese recorded the nova responsible for the Crab Nebular in Taurus 1045 A.D. This supernova would have been far brighter. And yet, the Chinese do not appear to have recorded any such object in this time frame. It's odd that the stars emit infrared light but not radio waves. We usually think of these wavelengths as being long and pretty much identical. Very interesting. Quite the intriguer in the sense of astronomy. This magnificent images only confirms that the Universe is in me... Woooaw!! Formation of black hole at the expense of sudden radiation and then the dimness subsequently controlled by monopoles to dual poles as the case may be. This is actually very cool. Knowing of what scientist can find out, amazing! That is why I am going to be taking astronomy in college. This is so great. I would love to go into space one day and see these wonderful images in real life. They are so cool. This is amazing! It is also at the same time scary, because if we recently discovered a black hole a thousand years after it was formed. One could form and in danger earth and we wouldn't even realize it for centuries! But still... That is probably not going to happen. It is just so cool how black holes form and how they are such a mystery to man kind. Vary cool, it is nice. Absolutely wonderful images on this site which I visit often. Thank you for the many wonderful photographs I have been able to download and print out. Thank you for sending me information on the most recently formed black hole in our galaxy, W49B! Please send any other photos of this supernova remnant and any confirmation information. Kudos to L.Lopez et.al and all others involved in the observation of W49B! Man, these stars are so starry! I never thought that stars could look so real until I saw them. It makes me amazed to see stars. Bye! A highly distorted supernova remnant, produced by a rare type of explosion. 26,000 light years from Earth. 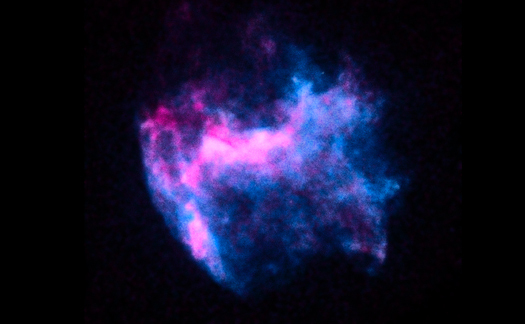 Combines X-rays from Chandra X-ray Observatory, radio data from the NSF's Very Large Array, and infrared data from Caltech's Palomar Observatory. About 60 light years across. X-rays are green and blue, infrared yellow and radio magenta. In the constellation Aquila in the Northern Hemisphere.